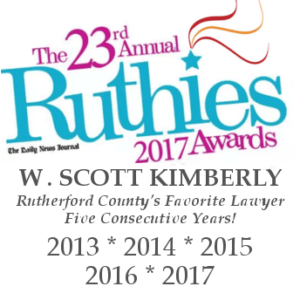 Murfreesboro Lawyer W. Scott Kimberly | An Experienced Murfreesboro Criminal Lawyer | What Should I Do After a Car Accident in Tennessee? What Should I Do After a Car Accident in Tennessee? Suzy Homemaker is driving her minivan down the interstate just outside of town. Suzy comes to a stop at a stop sign. Looking in her rear view mirror, she notices that a red sports car is bearing down on her vehicle at a dangerous rate. The driver of the sports car looks up from his phone just in time to slam on his brakes, but it’s too late. The sports car crashes into Suzy’s vehicle, throwing her violently about the interior of the car. A duty of care is the legal obligation owed by one person to another to conform to a reasonable person standard of care for the protection against unreasonable risks of harm. On the road, all drivers owe other drivers the duty to drive safely and obey all traffic laws and regulations. Therefore, drivers are expected to follow traffic laws, maintain control of their vehicles, and properly use all vehicle equipment. Rodney “Hot Rod” Stevens is taking his new Mustang for a ride down the interstate. When he merges onto the interstate, he notices a high volume of traffic around him. Whether Hot Rod knows it or not, he owes a duty of care to every other driver on the road to drive safely and to follow the rules of the road. To breach the duty of care simply means to fail to act in the manner required by that duty. On the road, a driver breaches the duty of care owed to other drivers when he fails to drive safely or fails to follow the rules of the road, among other things. Examples of drivers breaching the duty of care owed to other drivers include: running a red light; speeding; failing to maintain a lane of travel; and driving recklessly. When a driver acts in this manner, he fails to live up to his duty of care and has therefore breached that duty. However, simply breaching a duty of care is not enough to create an action in negligence. Hot Rod reaches the outskirts of town and traffic thins out. When he notices no other drivers around, he puts his pedal to the metal, reaching about ninety miles per hour. At this point, Hot Rod has most likely breached his duty of care to follow the rules of the road. However, no one else is around, so the remaining elements of a negligence claim have not been satisfied… yet. To establish negligence, a breach of a duty of care must cause some kind of damages. There are two key types of causation: (1) actual causation, i.e., the injury would not have occurred but for the breach; and (2) proximate causation, i.e., the injury must be the natural and direct consequence of the breach. If the injury would not have occurred without the breach and the injury is a natural consequence of the breach, then the injury is most likely caused by the breach. Hot Rod is still cruising on the outskirts of town. As he reaches the peak of a hill, he looks down at his cell phone. When he looks up, he sees a minivan stopped at a stop sign. He slams on the brakes, but can’t stop his vehicle in time, crashing into the minivan. If the driver of the minivan suffers any injuries as a result of the collision, those injuries are most likely caused by Hot Rod breaching his duty of care. The collision is the actual cause of the injuries, i.e., the injuries would not have occurred without the collision, and the collision is the proximate cause of the injuries, i.e., the injuries are a natural consequence of a violent collision. As mentioned above, any breach of a duty of care must cause some kind of damages. There are several different types of damages; however, the two main categories of damages are economic damages and non-economic damages. Economic damages include those damages that can be measured by monetary value, such as medical bills and repair bills. Non-economic damages include those damages that cannot be measured by monetary value, such as emotional pain, psychological damage, and suffering. A victim in a car accident may be entitled to compensation for both types of damages. Suzy Homemaker suffers from a laceration on her forehead as a result of the collision. Her minivan is also totaled. Suzy treats at the local emergency room and has her car repaired. However, she suffers nightmares as a result of the collision. Suzy’s medical bills and repair bills are an example of economic damages. Her nightmares and emotional suffering are an example of non-economic damages. Suzy may be entitled to compensation for both types of damages. Hopefully you now understand why an individual who gets in a car accident through no fault of their own may be entitled to recover compensation for their injuries, bills, etc. The bottom line is that every driver on the road owes every other driver a duty of care to drive in a safe and reasonable manner. If one driver breaches that duty and causes injuries to another driver, then he has acted negligently and may have to compensate the innocent driver for his negligent behavior. This entry was posted in Personal Injury Topics. Bookmark the permalink.